Key Verse: Verse 5 "We remember the fish, which we did eat in Egypt freely; the cucumbers, and the melons, and the leeks, and the onions, and the garlick:"
There are two primary varieties of cucumbers. There are slicers and picklers. 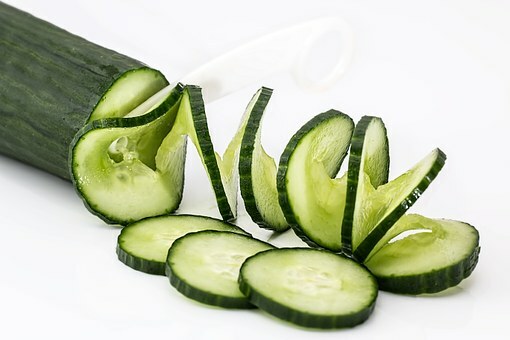 Slicers are for fresh use, such as in salads or vegetable trays; whereas picklers are, of course, used to make pickles. Cucumbers are a member of the gourd family, which also contains melons, squash, and pumpkins. Cucumbers grow on a vine in sandy soil. The sand gets warm during the summer giving the cucumber a more favorable growing environment. Cucumbers are 95% water, which means they do not contain a lot of nutrients. However, they are low in fat, sodium, cholesterol, and calories. Cucumbers also contain Vitamins A and C.
A number of travelers were making their way across the desert. The last drop of water had been exhausted, and they were pushing on with the hope that more might be found. They were growing weaker and weaker. As a last resort they divided their men into companies and sent them on, one in advance of the other, in this way securing a rest they so much needed. If they who were in the advance guard were able to find the springs, they were to shout the good tidings to the men who were the nearest to them, and so they were to send the message along. The word went from mouth to mouth, until the whole company of men heard the sound, quickened their pace, and soon were drinking to their hearts’ content. I have found the Water of Life; it is flowing fully; it is flowing freely. And so I stand and cry: “Water! Water!” Take up the cry, everyone, until every thirsty soul shall drink and live. So the next time you see a cucumber, remember the Word of God: the Water of Life. ✞ Every time you see a cucumber, remember the Word of God, and how important it should be in your life.